Mr Jaroslaw STARZYK, Permanent Representative of Poland to the EU, signs the protocol of accession of Ecuador to the EU’s free trade agreement with Colombia and Peru. On 11 November 2016, the EU, its member states, Ecuador, Colombia and Peru signed the protocol of accession of Ecuador to the EU’s free trade agreement with Colombia and Peru. This signature followed the decision by the Council to sign and provisionally apply this protocol. The common goal is to finalise all the remaining procedural steps before the end of the year so as to allow for provisional application to begin on 1 January 2017. The agreement eliminates high tariffs and tackles technical barriers to trade. It also liberalises service markets, protects EU geographical indicators and opens up public procurement markets. It includes commitments on the enforcement of labour and environmental standards, as well as rapid and effective dispute settlement procedures. In 2015, the EU was Ecuador’s second largest trading partner while Ecuador was the EU’s 60th trading partner, with 13.2% and 0.1% respectively of each other’s external trade. The volume of EU-Ecuador trade reached 4 594 million euros in 2015. The accession of Ecuador to the agreement will provide the parties with new market access opportunities for some of their main exports. These include automobiles, alcoholic beverages and dairy products on the EU side, and fisheries, banana, cut flowers and cacao on the Ecuadorian side. Ecuador will access the agreement based on the principle of regional integration with the Andean Community. The agreement will remain open for signature by Bolivia, the other member of the Andean Community. The trade agreement with Colombia and Peru was signed in June 2012. It has been provisionally applied with Peru since 1 March 2013 and with Colombia since 1 August 2013. Ecuador suspended its participation in the negotiations for the initial agreement in 2009. Negotiations to access the agreement resumed in January 2014 and were concluded in July 2014. 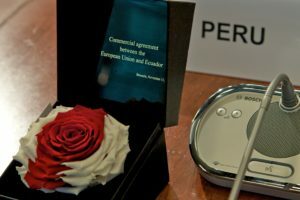 The legal revision of the agreement ended in February 2015.